The TaylorMade Hi-Toe wedge offers incredible versatility around the green with a design that provides a lower launch and more spin and features a sole cavity with three trapezoid-shaped pockets to optimize weight distribution. The full-face scoring lines ensure consistent ball contact out of the rough while the high bounce leading edge with increased belly offers less resistance for better contact on turf or sand. 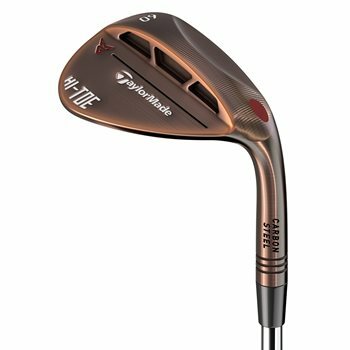 The Hi-Toe wedge also has a Channel Cut Mid-Sole that prevents excessive digging and has an aged copper finish for a stunning look. STANDARD SOLE 50º, 52º, 54º: The all-purpose grind that is perfect for full approach shots into the green. This sole is well suited for both normal and soft turf conditions. All of these lofts feature standard scoring lines. 4-WAY SOLE 56º, 58º, 60º: 4-way cambered sole with a mid bounce design of 10*. It is a great option for players with average or steep swings from normal turf and softer sand. ATV GRIND 58º, 60º, 64º: Channel-Cut ATV mid-sole with a 12° bounce. The "V" shaped leading edge moves through the turf and sand more quickly for better contact.